Even with so many moisturizers, restoring crème feels light and smooth against your skin and absorbs fast without any greasy or heavy feeling. Powerful botanical ingredients like acai and pomegranate provide antioxidant support while leaving skin feeling moisturized and smooth. The Centipeda Cunninghamii plant, native to Australia, works synergistically to enhance the many benefits of Aloe. Together, these ingredients deliver proven results for soothing skin, while vitamin B3 and beet root even out tone and texture to support a youthful complexion. Ingredients such as squalane, jojoba esters, glycolipids and beeswax show significant moisturizing properties and help restoring crème sweep across your skin. An anti-aging essential oil blend of lavender, petitgrain, basil, eucalyptus, lime and orange peel support Aloe to replenish and rejuvenate parched skin. To finish off this moisturizing powerhouse, we’ve added the latest chemistry which provided a new sugar structure that improves skin’s water barrier and retention. 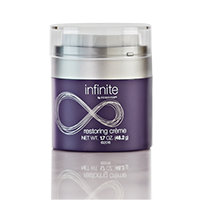 As the final very important step in infinite by Forever™, restoring crème seals in all of the powerful benefits your skin has just received so you can start slowing the sands of time.